You measure the glass area only from one corner to the other diagonally. 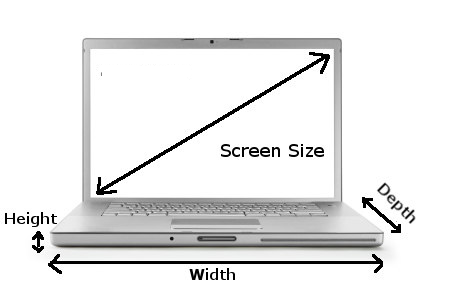 Manufacturer's will often lie about screen sizes in their laptops for marketing purposes. For example, Sony have a range of machines they call the VPC series that have 15.6" screens fitted, however Sony market these as 15.5" models. Upon opening the machine we find a screen manufactured by a generic LCD maker with 15.6 inches in size. Often the laptop makers will abbreviate the screen size, so a 14.1" screen size maybe advertised as 14 inch. Obviously the first thing that you need to do when searching for a replacement screen for your computer is determine the real size of the screen. What sizes are screens made in? Laptops and tablets generally use one of the following standard sizes, regardless of the laptop makers marketing efforts to appear unique or special. 7 inch - mostly used for tablet devices but was also used by some early netbook machines such as the ASUS EEEPC. 11.6 inches - the new standard in netbook screen size, this is my personal favourite compromise between portability and good desktop real estate size. 14.1 inches - this was replaced by 14.0 inch sizes, older WXGA machines use this size. 17.0/17.1 inches - These are the same thing, although many manufacturers would argue over the real size. Some would say it was 17.1 inches and some 17.0 - they two were interchangeable and this size is now mostly unavailable and obsolete. Although you find desktop machines and all in one devices with larger screens it's very rare to find any laptop computer with a screen larger than 18.4 inches. The most popular size is 15.6 inch which replaced the previously most popular 15.4 inch size. How do you measure your screen accurately. The most common mistake when measuring your screen size is to include the bezel area or the border around the screen. It doesn't matter if you've removed the LCD screen panel from the lid of the computer or if it is still in place, you measure only the glass area of the display without any border. The 2nd most common mistake is to measure the screen from side to side horizontally. You measure the glass area ONLY from corner to corner diagonally. For example from the bottom left corner to the top right corner, inside the frame area. As you can see from the image above, we have measured the glass area of the screen only from corner to corner diagonally and have not included the border around the screen. If you have removed the screen you will notice there is a thin metal frame around the glass, this should also not be included if you are measuring a screen that has already been removed from the lid of the machine. How Easy Is It To Replace A Laptop Screen?